SUBFAMILY Epidendroideae, TRIBE Vandeae, SUBTRIBE Sarcanthinae. 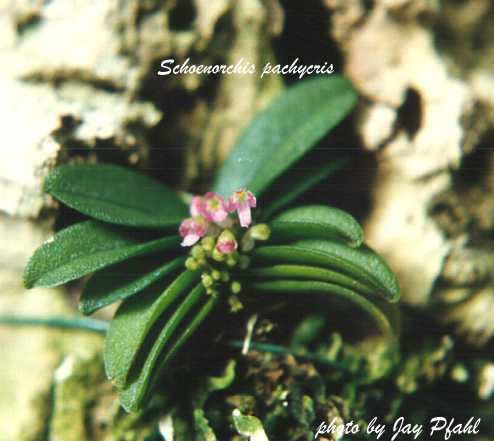 Schoenorchis consists of 10 species in Asia from the Himalayas to New Guinea. They are small, epiphytic, narrow leafed with keikisand roots most often forming only at the base of the plant. The inflorescence can be branching or simple and are multiflowered. The flowers have sepals and petals that are scarcely spreading with a 3 lobed spurred lip and a short column with a long beaked anther. There are 4 pollina, each 2 united and attached to a long thin viscidum. It was established as a genus by Blume in 1825 and his type species was Schoenorchis juncifolia. Species below that are synonyms of accepted names have an ~.